We're quite sorry about the impending shutdown as well, but it's a done deal, unfortunately. You may have noticed that things were quite passive on our side for the last while, and that's because we had to fight to justify any investment in the project. People are also definitely sad within the company, but it was decided at the highest levels. There is something of a silver lining. googlecode.com will take over search for their projects, and also take over hosting the Chromium search page. (If ChromiumOS or Android are important to you, reach out to whatever contacts you have at Google *now* and let them know!) Not all the details have been nailed down, which is why we didn't put it in the official announcement. Our apologies to you all, for letting you down, and thanks for all of the appreciation you've shown. PS As alternatives http://koders.com/ http://opensearch.krugle.org/ http://grepcode.com/ and http://www.antepedia.com have been mentioned by various people. We're not endorsing or not-endorsing or anything, we're just mentioning them so you can try them out, and see if they meet your needs. Sorry but, is Android or ChromiumOS in danger? I guess I missed something here. For a company who's core values (appear to be) search and open source, the closure of code search is an incredibly confusing message to be send. we highly recommend that you start putting out those fires and rebuilding those bridges because we will not. Google your future with us is getting darker by the second and once we are gone it is over for you. I have the same question as Victor, what's going on with Android / Chromium? Nothing, really. 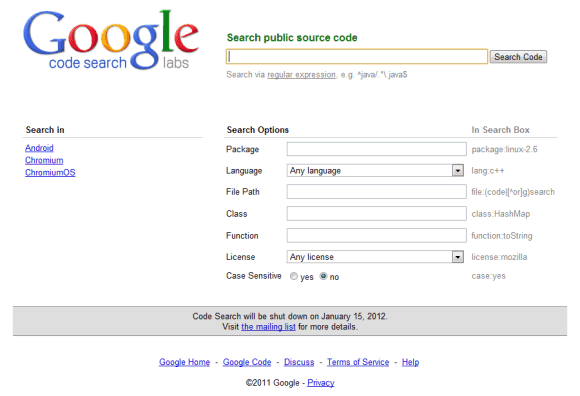 They're open source software and Code Search was used to search code. Just go to Code Search's homepage and you'll see 3 links for Android, Chromium and Chromium OS. Google really is slowly dying..
Hi, we're upgrading Koders.com in the next couple months. Come check us out and give us feedback!